Purpose: Air tissue expander systems offer breast cancer patients a number of advantages but present an unusual challenge when treating patients post-mastectomy with external beam radiation therapy. The primary aim of this study was to describe the planning protocol developed for external beam locoregional radiation therapy (RT) in post-mastectomy patients with in situ air expanders, and to quantify the effect of the AeroForm™ (AirXpanders®, Palo Alto, California) implant on target volumes and treatment factors. Secondary aims included an evaluation of clinical outcomes including acute side-effects. Methods and materials: This is a single institution review of eight female patients treated between March 2016 and August 2018. All patients received a prescription of 5000 centigray (cGy) in 25 treatments delivered five times per week. Specific density overrides were applied to critical structures in order to achieve the most accurate dose distribution. Acute side-effects were assessed at weeks two, four and six during radiation therapy, and followed-up at week six after the final treatment. 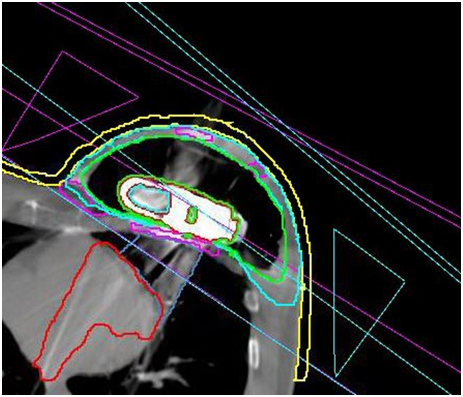 Results: A three-dimensional (3D) conformal radiation therapy (CRT) tangential wedged-pair technique, with additional contouring and density overrides applied to critical structures, is suitable for patients with breast air tissue expanders. 5mm–10mm of bolus over the entire chest wall throughout treatment enhances treatment delivery accuracy to the superficial skin layers without increasing early acute skin reactions. Conclusion: It is feasible to plan radiation therapy in patients with air tissue expanders requiring chest wall (with or without nodes) irradiation using an appropriate planning technique and density overrides applied to critical structures. The addition of bolus to the entire chest wall increases dose distribution accuracy. Early clinical results show that this treatment method is reproducible, has acceptable early toxicity, and results in similar acute toxicity to those seen in patients without air expanders. Our air expander protocol will continue to be adapted as additional prospective data is collected. Figure 1 shows an example of an air expander in situ on a CT transverse slice. Between March 2016 and August 2018, data was collected prospectively from eight female patients fitted with the AeroForm™ implant who were referred to our institution for post-operative radiotherapy. The objective was to develop a treatment planning protocol using the Pinnacle3 Treatment Planning System (TPS) v9.10 (Philips, USA). All patients underwent a computed tomography (CT) scan as per our standard breast treatment simulation protocol on the Optima CT 580 RT (GE Healthcare) scanner. All treatment plans were generated for the Elekta Synergy linear accelerator with AgilityTM head (Elekta, Sweden), and collapsed cone algorithm beam modelling was carried out in the TPS. The slice thickness of all CT scans was 2.5 millimetres (mm), and these were calculated on a 3mm dose grid size in the TPS. The radiation oncologist defined the treatment area by marking the superior level, inferior level, medial border and posterior border on the patient. These borders defined the beam shape of the multi-leaf collimator (MLC) using the beams eye view in the TPS. All patients received a standard planning target volume (PTV) prescription of 5000 (cGy) in 25 treatments delivered five times per week. The PTV, as defined by the radiation oncologist on the planning CT scan, included the skin, subcutaneous tissue and pectoral fascia (Figure 2). The planning dosimetry goal was to achieve 95% of the prescribed dose to 95% of the PTV. The following parameters were evaluated on the dose volume histogram (DVH) for assessment of plan quality: PTV receiving 95% and 90% of the prescribed total dose (TD), along with volume (in cubic centimeters) receiving more than 107% of the prescribed TD. The organs at risk (OAR) assessed included: lungs (combined) volume receiving >2000cGy, >1000cGy, >500cGy and mean dose (cGy); left and right lung volumes individually receiving >3000cGy, >2000cGy, >1000cGy, >500cGy and mean dose (cGy); liver volume receiving >3500cGy, and heart volume receiving >2500cGy, >1000cGy and mean dose (cGy). Prescribed OAR for standard breast patients included the heart, liver, left and right lungs. The following additional contours were required due to artifact present on the CT scan: artefact_tissue, artefact_lung, artefact_heart, capsule of the implant and canister (Figure 2). Density overrides were established by the planning team, to achieve the most accurate plan dosimetry as possible (Table 1). The values in Table 1 were dependent on CT density and the planning beam model. A three-dimensional conformal radiotherapy (3D CRT) wedged pair tangential planning technique was subsequently used to minimize the uncertainties (Figure 3). Daily imaging was performed throughout RT as per the department standard breast protocol. Two-dimensional electronic portal images (2D EPIs) were taken from the medial and lateral breast tangent beam angles to assess the lung depth treated at the central axis of the beam. The position of the metal canister and other expander changes were assessed daily. Kilovoltage (kV) planar images were taken on treatment days one through three to evaluate the set up position of the supraclavicular field and to check for any positional changes. These were repeated once a week to check positional accuracy. If positional or other changes were visible on the EPI, they were reported to the planning department. 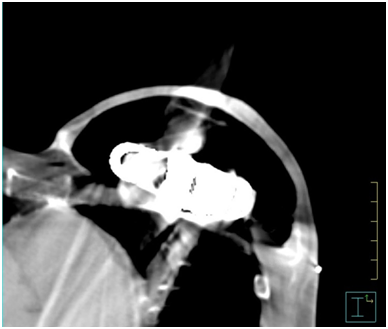 A repeat CT scan could then be performed on the patient and fused with the original CT to assess the overall dosimetric impact. Acute skin reactions were assessed at weeks two, four and six. A follow-up appointment was scheduled for six weeks after the last day of RT. Figure 1 AeroForm™ implant on a transverse slice CT scan. Main components visible are the centrally placed CO2 canister encompassed by a permeable silicone casing. Figure 2 Additional contours required to be created and overridden as per Table 1 guidelines to account for artefact present on the CT scan. Figure 3 Transverse slice of 3D CRT wedged tangential beams applied for planning in Pinnacle3. Any artefact within patient normal tissue that has a density of >1.2g/cm^3. Any artefact within patient heart tissue that has a density of >0.95 g/cm^3. Any artefact within patient lung that has a density of >0.1 g/cm^3. The CO2 filling of the air expander and the CO2 canister. Ensure to exclude the canister volume once outlined. The metal CO2 reservoir in the central area of the implant. Table 2 shows the prospectively collected data from eight female patients as they were planned and treated. The development of the treatment protocol was carried out in conjunction with the data collection. All patients, with the exception of Patient 4 (due to unrelated complications), received a standard PTV prescription of 5000cGy in 25 treatments delivered five times per week. The final dose distribution using the air tissue expander protocol was found to vary significantly from that of a standard breast plan due to the varying densities affecting the dose (Figure 4). The potential structural, positional and volumetric changes throughout treatment, as assessed by daily EPIs, resulted in no significant visible changes in any patient, irrespective of the planning technique. Repeat CT scans were therefore not required to reassess the treated volume. The dose to OAR according to the planning data for Patients 1-8 is outlined in Table 3. Different OAR were assessed depending on the laterality of the patient. The heart was of concern for patients being treated for left-sided breast cancer, while the liver was a priority for those receiving radiation to the right breast. Figure 4 Isodose distribution of an air tissue breast expander patient plan. Previous studies have shown that AeroForm™ air tissue breast expanders can function as intended with radiation doses of up to 70Gy10 yet their presence in situ creates a challenge for the RT planning team when treating post-mastectomy patients.14–16 We identified planning challenges associated with the device, and then prospectively collected data on a series of patients using the implant expander with the aim of developing a specific treatment protocol for this patient subset. The presence of a metallic cylinder in the center of the expander which leads to CT scan artefacts (with associated contouring difficulties), radiation scatter and dose inhomogeneities, and uncertainties with dose calculation (Figure 1). How to achieve adequate dose distribution to the rind of chest wall stretched over the gas filled silicone shell of the expander. The thickness of this chest wall is often very thin-usually 8mm or less. Appropriate beam arrangement when there is a large breast on the contralateral side, as seen in bilateral mastectomies and reconstructions. Detection of volume changes during the course of RT and the need to compensate for small volume changes. The thin thickness of the chest wall over the gas filled expander is a complex scenario for the TPS as it has to calculate dose to the buildup region while also missing backscatter. To raise the thickness of the layer, five to ten millimetres of bolus was planned conformally over the entire treatment field throughout the RT course, enabling a more accurate dose calculation. This likewise increased the dose to the subcutaneous tissue-a potential area of clinical failure in the chest wall after mastectomy. The density override of 5.8g/cm3 to the canister structure was established by transmission measurements in a solid water phantom at several depths with an air expander up-stream in a tangential-like setup. No patients required additional CT simulation scans due to positional or volumetric changes of their implants throughout the treatment course. However, the 2D EPI images were not high quality and were not able to detect small changes in the position of the canister nor changes in volume. 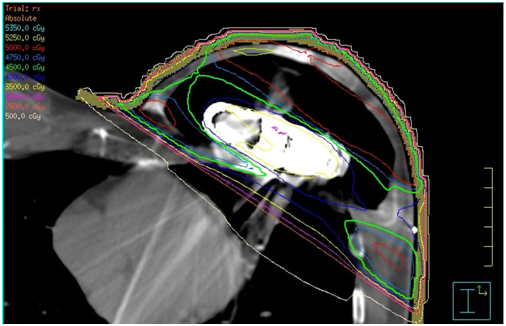 In addition to the poor image quality, research indicates that the EPI image registration can underestimate the actual bony anatomy setup error in breast cancer patients by 20% to 50%.17 A 3D cone beam CT (3D CBCT) imaging technique would be superior at detecting volumetric changes as well as setup uncertainties significantly.17 At the time of writing, we had not performed 3D CBCT daily imaging as all patients thus far had supraclavicular fields. The isocentre placement also created a significant collision risk between the gantry head of the linear accelerator and the patient and couch. It is our intention, as further data is collected, to investigate repositioning the isocentre to ensure there is no collision risk. This would enable 3D CBCT images to be performed daily to assess the volume more accurately. The isodose distribution was found to vary significantly from a standard breast plan due to the composition of the AeroForm™ implant as shown in Figure 4. The 3D wedged tangential pair technique eliminated dose uncertainties that were of concern using our standard breast intensity modulated radiation therapy (IMRT) planning technique that additionally would have required a 3D imaging technique. The results in Table 2 from the analysis of the homogeneity index (HI) show a range from 20.8% to 27.6% due to the wedged pair technique not being able to compensate for the shape and density variations (the latter mainly the shielding effect of the canister). As a secondary aim, we evaluated clinical outcomes specific to skin toxicity. Research indicates the use of chest wall bolus is associated with greater acute and late effects including moist desquamation and skin telangiectasia.18 With this knowledge, higher skin toxicity reactions than that of breast treatment without bolus were expected. Five out of seven patients experienced grade I or grade II erythema as an acute skin toxicity according to Radiation Therapy Oncology Group Common Toxicity Criteria (RTOG CTC),13 and two patients had moist desquamation (RTOG CTC grade III). However, in these patients, the area of concern was localized within the nodal region and was therefore unrelated to the implant. Patient 4 did not complete treatment due to unrelated complications and no clinical outcomes data is available for this patient. In patients with AeroForm™ air tissue expanders, it is feasible to plan with a 3D conventional planning technique. The addition of 5mm - 10mm of bolus placed over the entire chest wall increases the accuracy of dose distribution, as well as the superficial skin dose. Early clinical results show that the treatment method is reproducible and generates acceptable early toxicity. The clinical outcomes between breast patients undergoing PMRT with or without AeroForm™ expanders do not seem to differ with the use of the protocol, however we acknowledge that our findings are based on a small patient series. Data will continue to be collected prospectively to shape the protocol’s ongoing development. Further research into treatment imaging techniques would improve the accuracy of the canister position and implant volume evaluations. The authors wish to thank Aileen Eiszele BA(Hons), Dip.Ed., GradDipBus for manuscript preparation and writing assistance. McGale P, Taylor C, Correa C, et al. Effect of radiotherapy after mastectomy and axillary surgery on 10-year recurrence and 20-year breast cancer mortality: meta-analysis of individual patient data for 8135 women in 22 randomised trials. Lancet. 2014;383:2127–2135. Bates JE, Bradley JA. To treat or not to treat? A postmastectomy question. Int J Radiat Oncol Biol Phys. 2018;102(2):284. Wilkins EG, Cederna PS, Lowery JC, et al. Prospective analysis of psychosocial outcomes in breast reconstruction: One-year postoperative results from the Michigan Breast Reconstruction Outcome Study. Plast Reconstr Surg. 2000;106(5):1014–1025. Atisha D, Alderman AK, Lowery JC, et al. Prospective analysis of long-term psychosocial outcomes in breast reconstruction: Two-year post- operative results from the Michigan Breast Reconstruction Outcomes Study. Ann Surg. 2008;247(6):1019–1028. Rowland JH, Desmond KA, Meyerowitz BE, et al. Role of breast reconstructive surgery in physical and emotional outcomes among breast cancer survivors. J Natl Cancer Inst. 2000;92(17):1422–1429. Al-Ghazal SK, Fallowfield L, Blamey RW. Comparison of psychological aspects and patient satisfaction following breast conserving surgery, simple mastectomy and breast reconstruction. Eur J Cancer. 2000;36(15):1938–1943. Chen W, Lv X, Xu X, et al. Meta-analysis for psychological impact of breast reconstruction in patients with breast cancer. Breast Cancer. 2018;25(4):464–469. Heimes AS, Stewen K, Hasenburg A. Psychosocial aspects of immediate versus delayed breast reconstruction. Breast Care. 2017;12(6):374–377. Ascherman JA, Zeidler K, Morrison KA, et al. Carbon dioxide-based versus saline tissue expansion for breast reconstructon: Results of the XPAND prospective randomized clinical trial. Plast Reconstr Surg. 2016;138(6):1161–1170. Jagsi R, Momoh AO, Qi J, et al. Impact of radiotherapy on complications and patient-reported outcomes after breast reconstruction. J Natl Cancer Inst. 2018;110(2). Ho AY, Hu ZI, Mehrara BJ, et al. Radiotherapy in the setting of breast reconstruction: types, techniques, and timing. Lancet Oncol. 2017;18(12):Pe742–e753. Rembert JL, Heitz R, Hoffman A. Radiation testing of the AeroForm CO2-based breast tissue expander implant. Radiat Oncol. 2013;8:235. Moni J, Saleeby J, Bannon E et al. Dosimetric impact of the AeroForm tissue expander in post-mastectomy radiation Therapy: An ex vivo analysis. Pract Radiat Oncol. 2015;5(1):e1–e8. Tran T, Ding W, Subramanian B, et al. A dosimetric analysis of the aeroform™ tissue expander in radiation therapy. Int J Cancer Ther Oncol. 2014;2(3):020316. Topolnjak R, Sonke JJ, Nijkamp J et al. Breast Patient Setup Error Assessment: Comparison of Electronic Portal Image Devices and Cone-Beam Computed Tomography Matching results. Int J Radiat Oncol Biol Phys. 2010;78:1235–1243. Pignol JP, Vu TTT, Mitera G, et al. Prospective evaluation of severe skin toxicity and pain during postmastectomy radiation therapy. Int J Radiat Oncol Biol Phys. 2015;91(1):157–164. ©2018 Zissiadis et al. This is an open access article distributed under the terms of the Creative Commons Attribution License , which permits unrestricted use, distribution, and build upon your work non-commercially.